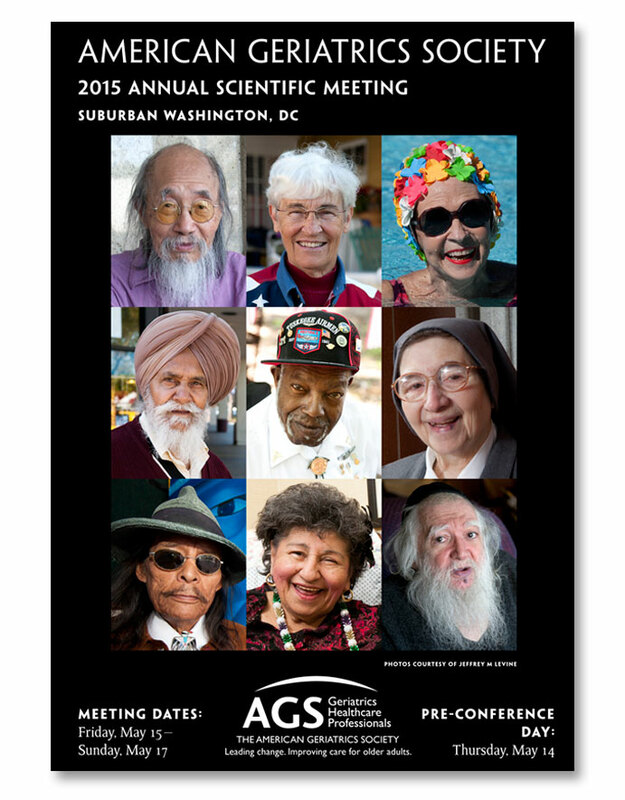 I am thrilled that the AGS is using my images on the cover of their Annual Meeting program. The collection of photos is the result of years of travel across America photographing aging. The message in this design is that our country's aging population is vast and diverse. In my images I try to portray the inner strength of my subjects that has enabled a long life, and explore spiritual connectedness with the world and society. I also like to show the commonalities of growing old and how the elderly fit within our culture, and present a realistic and positive view of the human journey that most of us will experience. Aging is not a popular topic to look at, as most people would rather see flowers, dogs, parakeets, or cute kids. Few people embrace images that tweak insecurities about wrinkled skin and thoughts of mortality. Ageism permeates the mass media's imagery of growing old, which contributes to stereotypes and negativity. In my view, the lack of images of aging in mass media contributes to our culture's collective denial of the aging process and distortion of expectations. Indeed, a great number of images of aging on prime-time television are in commercials for erection medications and incontinence products. However the phenomenon of aging is intertwined with the fabric of every human life, particularly for those who choose geriatrics as a specialty. The impact of the aging demographic on our society and healthcare system has yet to be measured, but we as geriatricians are acutely aware of its immense scope. "It is the humanism that excellent geriatrics represents, especially in dealing with the frail elderly and their families. Here we see clinicians committed to health care approaches that balance curing and caring, touch and technology. Basically, then, the emphasis is on life and fulfillment by patient and professional. The quality of the approach to the frail elderly is a key measure of our health system's compassion and competence, not merely for the elderly but for those of all ages." "Our work is pleasure, yet the outsider often wonders how we do it. Like so many of you, I enjoy older people. I like the art of medicine. I like the process of science. I am attracted to humanism and social-psychological dynamics. I favor the underdog. I enjoy a struggle and advocacy. Geriatrics and gerontology have satisfied those desires in me more than a person can hope for." Reference for this post is: Libow LS. Geriatric Medicine and the Nursing Home: A Mechanism for Mutual Excellence. The Gerontologist 22 (2) 134-141; 1982. Dr. Jeff Levine’s photography exhibit entitled “An International Celebration of Aging” will be at the University of Michigan Medical Center in the Taubman Gallery from June to August, 2015 as part of their Gifts of Art program. I'm at AGS. I was just looking at these pictures thinking how thought provoking and wonderful they were. Clearly we each get our own individual experience and path in life and your pictures demonstrate that perfectly! Thanks for the kind words Dan, and I was completely surprised and moved by Jennie Chin Hansen's comments on the photos at the AGS Business Meeting in DC.